One of my all time favourite picture books is The Lorax by Dr Seuss. It’s partly the reason why I’m a children’s book author and illustrator. So I thought I’d write about why I think it’s so great and how it has influenced my work – in particular on my wordless book The Weather Machine. As a kid, Dr Seuss was unlike any other author around. Whenever I discovered a new book of his I would naturally assume that it had only just been released. Years later I discovered that a lot of his great works like The Cat in the Hat, The Sleep Book and Green Eggs and Ham etc were published way back in the 50’s and early 60’s (which makes them even more amazing in their ‘newness’). Years after I discovered that The Lorax was from a later Seuss period. It actually came out in the year I was born and perhaps there is something about his message and that era which has some subcounscious connection to me? Of all Seuss’ books, The Lorax seemed to stand out for me. For one, it has Truffula Trees! Being a New Zealander meant that every cabbage tree I saw was proof that the Lorax might just be hiding around the corner. Of course Truffula trees are soft and fluffy, and cabbage trees are hard and spiky – but that doesn’t matter to a child’s imagination. The things I loved about The Lorax as a kid were the same things I love now – it’s still as vibrant and energetic and magical in pictures and words and imagination as it was more than 40 years ago when it was first published. AND it’s hugely successful (no point having a great book if nobody reads it). No one is infallibly great, and quite often Seuss irritates me with his made up rhyming words, but in The Lorax they’re perfect – “Your machinery chugs on day and night without stop, making gluppity glupp. Also scholppity schopp” – and “You’re glumping the pond where the humming fish hummed. No more can they hum for their gills are all gummed”. That environmental message is the real icing on the cake. It’s even more relevant now than when it came out. The funny thing was, it’s such a strong message but as a kid I was barely aware of it. Not unaware in a bad way – I was just so caught up in the magical world of The Lorax that the message of “let’s not use up every last resource and screw the planet” just kinda sunk in. After I left university, I worked in the film industry – I didn’t like it. I mucked around at some of the big advertising agencies – I didn’t like that either. Then in my mid twenties I had a very specific thought involving The Lorax. I was sick of wasting my time and talents churning out cliche advertising and pretending to be creative, and I thought: “Imagine if you could do just one thing – just one book like The Lorax – a book that had not lost any of its impact after so many years … that would be something worthwhile”. From that moment I decided to focus my creative talents on the world of children’s books. So for a long time I have been wanting to create my Lorax. I’d also been hugely influenced by the wordless books of Mordillo and Jean Jacques Loup and I had wanted to do one of those . But every time I tried to come up with something that combined the influence of these books it just seemed like I was trying too hard. Eventually, many years later, after illustrating more than 70 books, when I’d forgotten all about trying to create my homage to The Lorax, the influences came together all by themselves. In a lightning bolt moment, several ideas that had been lurking around in the back of my mind all fused together – which turned out to be my wordless book The Weather Machine. 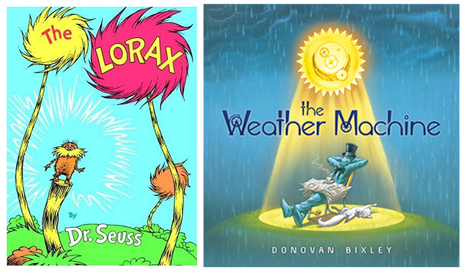 The magical world of Seuss’ Lorax had a huge influence on my Weather Machine. The Weather Machine is hugely influenced by Dr Suess, though I didn’t specifically look at any of his work or even think about him while I was creating it. 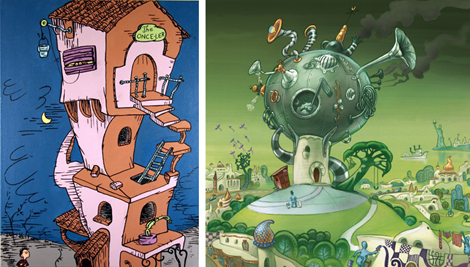 It would be hard for anyone of my generation not to be influenced by Seuss’ magical worlds. The Weather Machine deals with the issues of climate change when our hero decides to build a machine to control the weather. On a grander scale it deals more generally with man (it’s usually man) meddling with nature and trying to play God, like Frankenstein. Pretty heavy stuff? But I had always hoped that the format of a wordless book would make it less daunting – less preachy. Readers would be able to make up their own minds about what it all meant, rather than feel like they were getting a lecture on the environment. 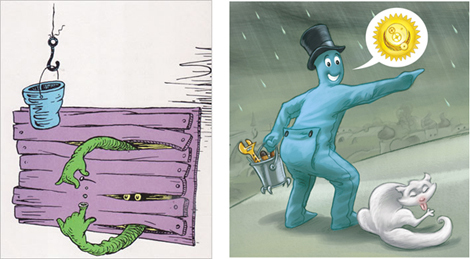 The influence of Suess is in that environmental message and the colourful, magical world and the fun of storytelling. On the surface The Weather Machine is just a fantasy story, with some slapstick silent movie fun. But hopefully readers will discover new layers of meaning hidden in the pictures as they got older. One of the strangest things that relates to the influence of The Lorax was the creation of my main protagonist. I realized only after the book was published that he has a striking resemblance to Seuss’ Once ler, the unwitting villain from The Lorax. We only get to see The Once ler’s gloved arms and hands and feet though. In The Weather Machine, my protagonist is also an unwitting villain, like the Once ler he’s just looking out for number one. He also wears a onesie baby suit and a top hat – which is supposed to represent that he thinks he knows better than everyone else, but he’s actually just a big baby. But perhaps he was also my subconscious version of what The Once ler looks like in the full? I don’t know if The Weather Machine (or any other book I might create) will ever achieve the influential level of The Lorax – but it’s a great ambition to aim for and I love the idea that maybe, just one person out there might be affected by what you’ve created and it might make them want to do something too.